From the expletives, it appeared the rain-lashed grey nomads repeatedly jack-knifing their massive van into the bushes around their campsite as thunder rumbled thorough the night were NOT “Livin’ the Dream” their van proclaimed. Although their inadvertent behavioural benchmark reinforced the pact between Pilchard and I. ‘If I ever …’ Pilchard began, but I knew how this story ended. Unlike the hapless travellers cursing their way through the wanton destruction of several fine shrubs before they gave up and departed, we’d so far avoided setting up on an unfamiliar site in the rain and dark. BUT … I knew what to do if it ever happened. I tuned back in as Pilchard concluded with his usual instruction – ‘… just shoot me’! The caravan park was an unlikely spot for our adventures in and around North-eastern Victoria’s Bright to begin. But strangely appropriate! Our wicked and unkind laugh over the night’s misadventures was accompanied by the spectacular colours of the ever present falling leaves – magically whisked away each day by the caravan park cleaning fairy! If heights scare you rigid, try to avoid sitting on the drop-off side of the car on the steep and winding roads up into Victoria’s High Country – at the very least, don’t look down! That way you might even enjoy climbing the range – first through the ironbark forests where Superb Lyrebird could make an appearance; then into stands of endemic species Alpine Ash; followed by the stark and ghostly remains of the 2003 bushfire that burned out millions of high country hectares; and finally into the sparse Alpine vegetation above the tree line. And there, above the tiny village of Falls Creek precariously perched on the side of the mountain range is Australia’s highest body of water – Rocky Valley Lake. As the snow began to fall – Yes, SNOW! – the signs about snow-chains and the orange road markers suddenly made sense … and the Outback seemed far, far away to this Aussie traveller who’d only ever seen snow twice before! While I’ve experienced sub-zero temperatures before, 0º C is the coldest maximum temperature I’ve EVER lived through! As we lurched from Bakery to Berry farm; Indian/Italian to Sri-Lankan/Aussie pub cuisine; hot chocolate to champagne, the whole trip seemed to be turning into a deliciously tragic over-eating marathon. I couldn’t have squeezed in the local pub’s ‘Alpine Breakfast’ (whatever in hell that was) eaten under a ‘heated umbrella’ (whatever in hell that meant) for quids (whatever in hell they are). 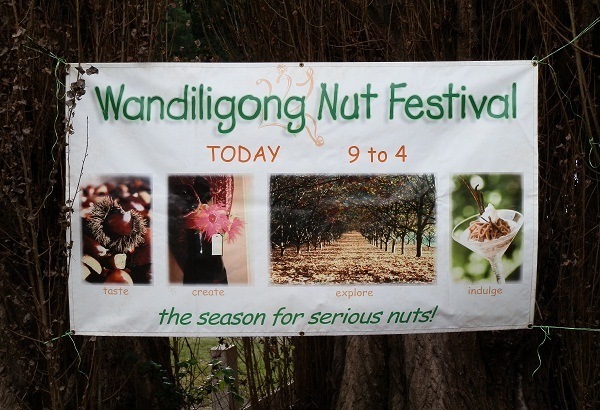 So indulging in hot roasted chestnuts, hot chocolate and dutch pancakes smothered in maple syrup, lemon and icing sugar at the annual Wandiligong Nut Festival was true to type. The local April sun was so pleasantly warm I can’t imagine why the Dragon classic wasn’t titled ‘April Sun in Wandiligong’ – but it didn’t stop us singing along with the excellent cover band. Aussie classic anthem Downunder, sounding absolutely NOTHING like the Kookaburra song, had Melbourne Yuppies – all haircut and GQ country weekend – kicking back with grey nomads, locals and travellers. Once we’d finished up at the Beechworth bakery, we were ready to give our full attention to yet another town with links to bushranger Ned Kelly. While I loathe the word ‘precinct’, it really is the easiest way to describe the section of the town set aside for such things as the gaol with its fabulous Crime Scene gift shop (Hey, D! I haven’t forgotten your birthday prez! ), the courthouse and holding cells, early fire-fighting equipment displays, the inevitable statues of NK – and the self-proclaimed busiest Morse Code Telegraph station in the world!! I’m not sure how many other contenders there are, if any, but surely the Morsecodians wouldn’t make this kind of claim lightly. Would they?? Starting at a mere AUD $5 (although it’s probably worth more than that in many other currencies at present) sending a message in Morse code to anyone in the world has never been so easy. You KNOW you want to!! While I’m not afraid of lizards, I have no desire to prove it by picking them up and playing with them. I thought the scaly reptilian head I spotted peering up at me through the grass at the side of the walking track round Lake Guy at Bogong Village was a lizard. I called Pilchard over as it looked a little different to the usual skinks scuttling about in the sun. Then it moved backwards. Uh-oh. Lizards aren’t able to move backwards which meant it was – AAAARRRGGGHHHH! A snake!! Red-bellied black, according to Pilchard. I was miles away by then, so I can’t confirm his identification. Along with random and unexpected wildlife, the lake circumnavigation involves beautiful scenery, a magnificent lunch setting, Steve Parrish-like photographic opportunities – and a somewhat disconcerting walk through a tunnel under the dam wall. Just as well the snake didn’t appear in the tunnel – nowhere to run or hide down there!! It’s a little known fact that altitude sickness can kick in from as low as 1700 metres above sea level. That’s the only explanation I can find for the dizziness, shortness of breath and constant need to stop and rest as I climbed the track to the summit of the Horn – at 1723 metres, the highest point of the Mt Buffalo National Park, a monolith that looms behind Bright. Or in front of it, if you prefer. Proof – we BOTH climbed the Horn! Then again, the vertiginous sheer drops and cold buffeting winds could have caused it too. But I’m sticking with altitude sickness – because the Horn is the highest lookout to which I’ve actually climbed (from the carpark below, not from sea level). After a couple of days in the Victorian high country, staggering views from unbelievably scenic lookouts became commonplace. But no matter how commonplace, they never become ho-hum. And Australia’s highest mountain, Mt Kosciuszko obscured by cloud and this tenacious traveller who just WOULD NOT MOVE!!!! The life-changing message – ‘We are all reptilians and the aliens are stealing our souls’ – was an incongruous addition to the spectacularly scenic landscape of Lake Buffalo. But perhaps it’s a cryptic message of courage – if we are indeed all reptilians, then there’s no reason to fear snakes, right? And if the aliens are stealing our souls, then it probably doesn’t really matter if I fall from a great height, does it?! I had no idea our Victorian Alpine country adventure would be so much fun it’d make battling my twin fears of snakes and heights such a pleasure! But now I DO know, I’ll be back for more! Not quite enough photos here for you? RELAX! There are WAAAAAY more HERE on Flickr!! @PDP – Haha! Maybe I’ll change my blog name to ‘A cup of Tea with Red’! Whaddaya reckon?!?! Seriously, glad you enjoyed it!! @CA – Thanx! The good thing to know is if I can do it, it’s not that difficult!! But seriously, the impressive view is like nothing I’ve ever seen!! Great post and my type of adventures. I would love to make that climb! I enjoyed your mountain adventures, and I can appreciate your feelings about steep drop-offs on some of those mountain roads. But I want you to know that I wasn’t the least bit winded when reading about your climb to the Horn. Your images and words are such a joy Red, and still so very ‘cup of tea’ worthy. You know something’s good when it makes you laugh out loud and gasp in wonder all in a short space of time. Excellent post. @Rita – It’s a pleasure to show you around! Just wait – there’s WAAAAAAY more excitement to be had! Thank you for allowing me to take this trip vicariously with you. I’m sure that traveling the Blogland network is the only way that I will get to see the world. You made an excellent tour guide and I will be back to stowaway for your next adventure. Now you’re talking! The alpine area is fantastic and no matter how many times I go there I still love Mount Buffalo. I must be the only bloke in Australia who hasn’t gone to the Beechworth bakery. Is it really that good? @sarchasm – I shall count the minutes!! @Greg – As an alpine virgin I couldn’t believe I was still in OZ! And just btw u & I, the BB is good – but it’s turned into a chain (6 outlets). The Edelweiss Bakery of Bright was the star of the trip, closely followed by the Eaglehawk Bakery near Bendigo we visited on the way home!!! @River – Yes, it’s very ‘Wuthering Heights’, isn’t it?! I haven’t seen such a glorious array of autumn colours together in one place before. This really is a world apart from the rest of Australia. What I’ve seen, anyway! @Liara – Thank you! I hope it’s as much fun for you to look at as it was for me to visit!! Wherever you are, you find timeless beauty. Always appreciate your photos and more. I love seeing Australia through your eyes. The Rocky Valley Lake looks like the desolate windswept area that romance novels often begin in. I LOVED the autumn colours in the first photos. Ha! I love your writing style – you had me giggling all the way through this post. It sounds like you had an absolute ball, snakes and altitude sickness notwithstanding. @ryan – WOW! Sounds exciting – but you’re right! Leave this off your itinerary and it’d be a sad loss! @Mary – I think I deleted WAY more photos than made the cut!! BUT … it gave the Xmas camera a real workout! @Aleah – Thank you! And same to you – just read your 7 Super Shots! @Manzanita – I’ve NEVER been to the States! We’re thinking of modifying the camper trailer – if it could float AND fly, that’d be a bonus! @Betty – I’d use the word ‘terrifying’, actually!!! @Katja – Sure did! The more danger, the more memorable the adventure!! Just a shame I didn’t photograph the ‘good’ bits! @Pearl Maple – So do I!!! @Kath – I could live with trading making fun – they don’t actually sound that different!! @SFlaGuy – Haha! Don’t tell me – you buy magazines for the PICTURES!!! @NixBlog – So I know NOW! @Glen – Then my work is done! I was a high country virgin (sounds kinda dirty, huh?!) until this trip – can’t wait to go again!!! @Gladys – I was well away by sunset – no way I want to be driving those roads after dark!!! i love the new look here. gorgeous photos, i love all of them. what magical views and scenery! Really love your pics. The landscape one of the Horn is wonderful. You have a talent for photography, that anyone can see! OK, kiddo, let’s trade. When was the last time you were in the States? Now I’ll have 5 bedrooms, although they won’t all be used as BR’s. 🙂 You’re welcome in our summer. (You wouldn’t like our winters.) Ha Does the caravan float? P.S…. I don’t cook but I’m finding the cleaning fairy. I am getting ready to do the trip around the block …. this will have to be an area to spend some time at. I’m beginning to think there might just be a little more to Australia than BBQ’s, lager and a metal bridge over a harbour. IT really is quite stunning really, isn’t it? I was trying to figure out how you drove all the way to North Carolina then I spotted Ned Kelly and decided to actually read the article. As much at I think I know your little pat of the world, the more I realize I know nothing about it but I would be quite at home in it. Great post. I was tempted to make fun of the W-dong nut festival until I remembered that Switzerland has a very popular and proudly-advertised Chestnut festival in autumn! Terrific photos as usual, Red! @Dianne – SO fabulous I’d love to do it all over again, this time including the bits (and bakeries!) I missed!! @Jo – The cleaning fairy is alive and well in caravan parks!! And stay tuned – WAY more adventures to come! @Manzanita – Haha, I’ve been nervous about putting pix of random people on my blog, but I figure no one could really identify them from my photos!! But the other people are all tourists – maybe you should join them?? @Tracey – Glad to know there’s ‘scientific’ evidence to support my altitude sickness findings! And tell everyone else not to bother entering your comp – the buff is MINE! @Go Camping – Vic Tourism owes me BIG time!!! And now I’m back, I want to go all over again – it’s SO different to other parts of OZ I’ve visited! @Nielson Brown – Weird, but I never thought of Aussie expatriates as readers when I first started my blog … glad my stories/pix lived up to your memories! And you’ll be thrilled to learn the Beechworth Bakery now has SIX franchises!!! @Alessandra – Hahaha! Everything else has been done to Ned – I’d LOVE to see a Ned chestnut roaster!!! I’ve experienced that same altitude sickness at 1700 too! What a glorious tour! Loved the panoramic views! And by the way, I could show you snow and REALLY COLD temperatures. Fabulous photos and a great story. Seems like you are having an awesome trip. Here’s to caravan park fairies everywhere – love them parks. Look forward to your next installment. Ain’t no people where I’m moving to. I want a cleaning fairy. Bright in the fall must be magical …. Imagine the park fairy actually sweeping up all those leaves. Yes! I would have had a go at sending a message in morse code … Looks like a fabulous trip Red. Lovely photos and story. Makes me want to head to the Victorian High Country right NOW. Vic Tourism should thank you for making this sound so wonderful. I was last at Falls Creek (where I first saw snow when I was 8yrs old) so am well overdue to return. I can’t remember such wonderful views and scenery, but then again not many 8yrs old give a toss about that sort of thing! I particularly enjoyed the inept grey nomads, the tragic singing and your bravery with reptiles. As an aussie no longer living in the country, all I can say is thanks for posting images on the many places I have spent time at in the past. There are many wonderful places around the Bogong High Plains and you have captured them beautifully. Beechworth bakery whether it be Beechworth or Healesville I always stop for a pie and sausage roll when I am in the country. Howdy Red, I wrote about Bright and Mt Buffalo in my blog a few weeks back. But…I did not experience the snow you spoke about. Lucky you! I did experience the snow at Kiandra last week so I did not miss out entirely. You might be interested in my entry into the “most scenic public toilet in Australia” competition. It is in my blog post this week. Seriously, I think it is in number one position. @Sallie – This trip was an eye-opener for us ‘High Country’ virgins!! Truly amazing – but we didn’t sacrifice our caravan park cred to do it!! @ladyfi – Thank you! I’m glad my camera work didn’t let me down – it really does look like this! @Beach Bum – HHHHMMMmmm… is that good??!! @FruitCake – Haha, then my work is done!!! But if you miss the Beechworth Bakery, there are also good ones at Myrtleford, and Mt Beauty. And I’ll bet you could get some killer accomodation deals in Bright now that the Autumn Leaves festival is over!! @Magsx2 – WHY does everyone want to see the snake??!! Next time I’ll get P to take one – he is foolishly not afraid of them!! @MJWC – I’m glad the pic looked like that, because it sure as hell FELT like that as well!!! Who knew such places existed??!! @Jane & Lance – Remind me to always schedule my posts at this time so you can be the first to leave your lovely comments!! Tragically, my technophobic bent means I haven’t the skills to successfully doctor photos – so WYSIWYG!! @Andrew – Haha! You must be psychic! I thought I’d whip up a quickie (so to speak) given my absence from cyberworld for the last couple of weeks!! Glad you liked it!! @Ann O’Dyne – Weirdly, the rain didn’t bother me there either! It certainly didn’t stop us from doing stuff, and if all else fails, duck into a bakery!!! @Fun60 – I waited until I could wait no longer … the people I was with had long since disappeared!! She will forever be ‘Kosciuszko Girl’ to me!! Sigh. A week in Bright right now would be a lovely thing – via Beechworth bakery, of course. I didn’t feel this urge til I saw this post. Thanks a lot. Now that was an adventure. Made me feel like I was there. Those mountain shots are just gorgeous! Love the red splash of autumn that is now appearing in your part of the world. Sound as though you are having some great adventures. I certainly loved reading about your travels in the high country. Loved the photos too. Why is there always someone who gets in the way of the view – no matter how long you wait! As always, you gave me an outstanding tour. I love the picture you took from the car that looks like we are going to drive off the face of the earth. Mt. Kosciuszko? There is a town here in Texas, not far from where I live, named Kosciuszko. Except that it is not on a mountain. They do have lots of bakeries, however. Only one snake is good, right? Absolutely exceptional photos Red. We are going through early spring and everything is popping out, while you are experiencing your Autumn. The colours are beautiful. I never thought about maple trees growing in Aussie land. Do you do the sap collecting from the trees as well in the spring? Rocky Valley lake looks like a painting and the boat out there looks like it rises up on both ends – like an olde norse boat? I can actually see the snow falling at Falls Creek – that’s pretty neat. I would love the sing a long at the Festival – nice shot of ya Red 🙂 I also remember the post you did on Ned Kelly – that photo looks great. You are right – I think it would be fun to send a message in morse code and yes, I would want to. The photo of Lake Guy and the Victorian Alps mirror image is stunning – Really like this. Congratulations to you and Pilchard on your successful climb to the summit of the horn. 1723 metres is a heck of a big hike – good thing you had that snack with you. The sheer drops would have been exciting and probably frightening at the same time. Nice shot at the top of the summit both of you and also the hills n valley – Once again, I am adoring your post. Thanks for sharing guys n have a great day. I liked reading about your adventures…especially the part with you singing Down Under. The snake part was thrilling… You should have gotten a photo. Don’t worry. I’m joking. I think so too Andrew – wonderful post and pictures thank you Red. My kind of country. I don’t know what to say, except fantastic post and great photos and I can tell it only took you five minutes to compose. These are truly spectacular images of places which look so amazing that they cannot be real. But, through you and the equally intrepid Pilchard, we not only know they exist but we are informed of all the best local bakeries and loos en route!! And, we are certain that you have tried them all! !